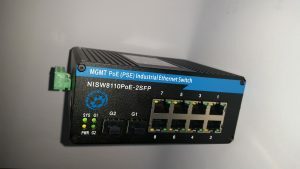 The Netshield Industrial Ethernet (IE) switch uses standard Ethernet protocols and has rugged connectors and extended temperature switches suited for an industrial environment. Components used in plant process areas must be designed to work in harsh environments of temperature extremes, humidity, and vibration that exceed the ranges for IT equipment intended for installation in controlled environments. Industrial Fast Ethernet with FE SFP Unmanaged Media Converters – DIN Rail Mount. Industrial 10/100/1000 Ethernet with 1 x SFP Unmanaged Media Converters – DIN Rail Mount. Industrial 10/100/1000 Ethernet with 2 x SFP’s Unmanaged Media Converters – DIN Rail Mount. PoE Industrial 10/100/1000 Ethernet with 2 x SFP’s Unmanaged Media Converters – DIN Rail Mount. Industrial PoE+ Fast/Gigabit Ethernet 10/6 Port – Managed Switches – DIN Rail Mount. Industrial Fast Ethernet 8 Port – Managed Switches – DIN Rail Mount. NIRSWFE6080-M Industrial Ethernet switch, Manageable, 8 X 10/100M RJ45, DIN35 Rail Mounting Type. Ring recovery time < 30 ms at full capacity. NIRSWFE6062-M Industrial Ethernet switch, Manageable, 6 X 10/100M RJ45, 2 X Multi mode 1310nm Fiber Port, DIN35 Mounting Type. Ring Management (recovery time < 30 ms at full load). NIRSWFE6044-M Industrial Ethernet switch, Manageable, 4 X 10/100M RJ45, 4 X Multi mode 1310nm Fiber Port, DIN35 Mounting Type. Ring Management (recovery time < 30 ms at full load). NIRS232-ETH1 Industrial 1-Port RS232, RS485(2/4-Wire) & RS422 Async Serial (230Kbps) to 10/100Ethernet conversion unit. No Power supply included.